For this trick, you need three plastic or paper cups and several dog treats. 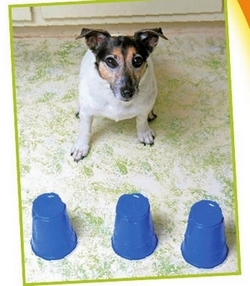 You want your dog to sniff each of the three cups and show you which one has the treat in it. Start by placing one cup upside down on the ﬂoor in front of your dog. Take a good-smelling treat (such as cheese or meat—a plain biscuit probably isn’t going to do the job) and put it underneath the cup. When your dog sniffs at the cup, make a big deal over it and lift it up to let him get the treat. Repeat several times. Next, add a second cup without a treat under it. Make sure you know which cup has the treat! Allow your dog to sniff at both cups. When he settles on the one with the treat, praise him and give him the treat. Repeat several times, then change around the order of the cups to make sure your dog is actually snifﬁng for the treat, not just going back to the same cup every time. Once he is doing that, you can add a third cup. This is the easiest trick in the world for dogs to learn because they can smell the treat. Once your dog gets the idea, you can put a treat under the cup when he’s not looking, and he’ll still pick the right cup every time. The nose knows!